The Warehouse’s financial services are now offering two no annual fee credit cards. Purple Dollars Visa: You will earn Purple Dollars every time you use your card anywhere Visa is accepted and spend your rewards at The Warehouse. 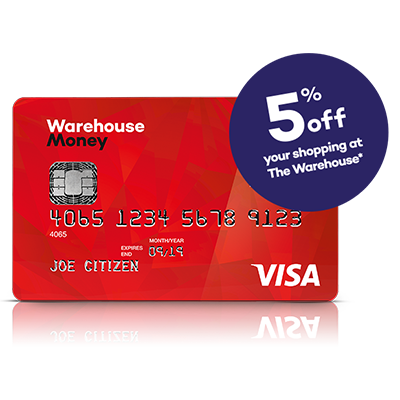 I decided to go for the Warehouse Money Visa card. The application is online and some-what-easy, although if you have a PO Box address don’t expect it to allow you to add this to the mailing address box on the form. After submitting if you meet the credit criteria you will get an instant response. My card took a wee bit of time to get to me, but when it did arrive they had got my name on the card wrong. After sorting that out with the New Zealand-based call center staff who are friendly, but need more practice and relay ‘life customers’ expertise I was able to login to my account for the first time. When you log in to manage your account, The Warehouse group have utilised Sandstone Technology which allows the end consumer to do so much more online than other financial services providers. In fact is would put most New Zealand banks to shame. Conclusion: Well I like The Warehouse and there’s nothing like getting 5% off when you purchase something – for nothing. For everyday kiwi’s it’s a good option if you do not want to pay any fees as most of the banks credit cards come with fees especially those that have rewards. Information on my website is of a general nature only and isn’t financial advice. If you’d like advice that takes into account your particular situation please contact a financial adviser.